Jimmy Broddesson at bluewater tells me he's now the central agent for sale of the new-build 54m motor yacht from Mondo Marine. The flagship of the yard's fleet, she's a full displacement yacht designed by Luca Dini and built to Lloyds class. MCA compliant, she accommodates 12 guests in six staterooms. 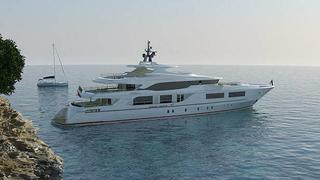 The Mondo Marine 54 is asking €28 million.